Street food is an interesting intersection of culinary history mixed with cultural interest. In Japan, a country that prides itself on culinary distinction and strong socially enforced etiquette, where eating while walking in public is considered uncouth, street food reveals a very interesting facet of the Japanese culture. Takoyaki is a popular street food dish in Japan. Made with wheat flour based batter, takoyaki are tasty and attractive small flour balls grilled to a buttery fragrance on the exterior and a warm moist chewiness on the inside mixed with the fresh ingredients of dried octopus, tempura scraps, pickled ginger and green onions. They are typically grilled to a lovely golden brown and topped with a sweet and savory takoyaki sauce. 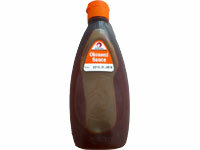 This sauce is like a Japanese version of Worcestershire sauce. Mayonnaise is also added as well as shavings of dried bonito (a type of fish). Takoyaki are typically served on paper trays and feature serving sizes that range from six to ten takoyaki balls in each paper tray. Toothpicks are provided for picking up takoyaki balls to be enjoyed. Takoyaki’s creation was credited to a street vendor named Tomekichi Endo in 1935 in Osaka, the Kansai (Western) region of Japan. Takoyaki was said to have been inspired by akashiyaki, a form of dumpling made from egg batter and enjoyed by dipping in a dashi broth. But the history of takoyaki can be traced further back in time to the 1600s when French food was first introduced into Japan. Battered food dishes first began appearing at around this time. Two other subsequent events helped to further popularize the use of flour in Japanese cuisine. The first was the great Tokyo earthquake of 1923, which caused a huge shortage in food. Following the disaster, in order to create cheap and filling food, experiments using flour and water began. This helped pushed popularity for flour-based dishes created during this time. Following the Second World War, flour was sent as relief to Japan by the US and continued to popularize the use of flour in Japanese cuisine. The creator of takoyaki, Tomekichi Endo was said to have decided to use octopus as the ingredient of takoyaki because in Osaka where he lived, octopus was plentiful. His creation became so popular that today, it can be found all over Japan. Takoyaki is enjoyed in Japan year round, but especially during the summer at festivals. Japanese festivals, known as Matsuri, typically celebrates traditional holidays and are held outdoor at local shrines where street food such as takoyaki are available for sale along with souvenirs and games. In Osaka where the takoyaki was first invented takoyaki is still famous and well known for their tasty invention, and visitors to Osaka can easily find all kinds of takoyaki paraphenalia and souvenirs from cell phone straps to USB devices. A takoyaki museum can even be found in Osaka’s Universal Studio where visitors can sample the takoyakis of five leading takoyaki vendors. In Japan, although street vendors and shops selling takoyaki remain highly popular, many also make takoyaki in their own homes. There are two primary ways to make takoyakis at home. 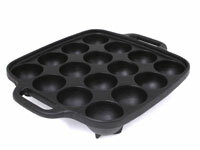 A takoyaki cooking tray can be used over the stove or an electric hot plate cooker designed for takoyaki can be used. What began as a small individual vendors selling a popular local street food item has today grown into franchises that produce a wide variety of takoyaki with a wide choice of ingredients and preparation style which have extended beyond the shores of Japan into other Asian countries. The first step in takoyaki making is the preparation of the batter. Takoyaki batter dissolves flour into dashi stock with water. Ingredients for takoyaki should be prepared beforehand. Octopus pieces, ham, cheese and shrimp are commonly used ingredients. 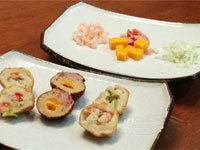 These ingredients are usually diced into small pieces to be placed into takoyaki during preparation. 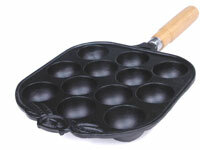 Once the batter is of the perfect consistency, the takoyaki pan can be preheated on high. Grease each individual half spherical hole in the teppan takoyaki pan. Once the pan is heated to the ideal temperature, the prepared batter can be poured into the pan. The batter should fill half the pan with just enough space left for adding your choice ingredient. After adding the ingredient, the remaining space of the sphere can be filled up with additional batter. When the base of the sphere turns batter a golden brown, turn the takoyaki over. Typically two metal picks are used for this task to turn the takoyaki over with ease and create the perfect spherical shape. Additional batter is added as needed to create perfectly spherical shapes of each takoyaki. Using the metal picks, turn the takoyaki at ninety degrees at intervals to give it an even grill. Once the takoyakis are cooked to a golden brown on all sides, they can be taken out of the takoyaki pan. 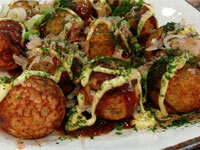 Okonomi sauce, a thick version of Worcestershire sauce, and mayonnaise are spread over the takoyaki. Aonori, green laver, and dried bonito shavings are then sprinkled over the takoyaki balls. Finally, the takoyakis are ready to be eaten! The fragrant grilled golden brown exterior holds the chewy dough center that encloses a juicy piece of octopus meat. Today, takoyaki is one of the famous Japanese food export in many other parts of Asia, enjoyed by people all across Japan and in the wider Asian region. Takoyaki may not be an easily accessible street food outside of Asia, but with easy to use takoyaki pans, you can try your hand at making this delicious comfort snack of Japan. Equip your kitchen with stove top or electric takoyaki teppan pans to create this unique and tasty dish. While not all the original ingredients may be found where you live, you can get creative with ingredients and come up with you very own takoyaki creations. Even in Japan today, there are many options and ingredient pairings other than the classic filling of octopus. Shrimp, ham, and cheese have been used as replacements for the filling. Some have even used chocolate filling to create a dessert style takoyaki.